Abraham Lincoln delivered the Gettysburg Address at the dedication of the Gettysburg National Cemetery on November 19, 1863. Fourscore and seven years ago our fathers brought forth, upon this continent, a new nation, conceived in liberty and dedicated to the proposition that all men are created equal. Believe it or not, 106.7, a local radio station, started playing Christmas music nonstop this weekend. It was enough to get me into the mood so we did some shopping today. = ) Last year at this time, I was done with everything wrapped and ready to place under the tree. Of course, last year at this time, I was working three jobs! I can't believe I actually did that. We're going to Bertuccis for pizza this evening. Yum! Brr, it's cold! 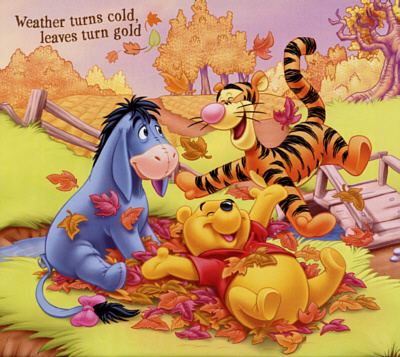 This picture of Pooh makes me feel cozy. Sue and I interpreted Urinetown, the Musical at Smithtown last night. It's such a fun show, I wish we could interpret it again. I never feel that way. I always think I need to take a break from a show after we've spent the time preparing to interpret it. The more I see it (or hear it, as last night), the more clever and intelligent I think Urinetown is. I also went to see the youth production on Monday evening. They did a spectacular job, as usual. Some very talented kids in that group. On Tuesday, Bill and I celebrated our mutual birthday. We went to Milleridge Inn with Billy, Kim and Carl. Kelly had to run the lights for the youth production so she couldn't be there. = ( We had a fun time and the food was so good. I hadn't really thought about going there for years. I think the last time we were there might have been for Kim's confirmation. I thought about it because I made pot roast recently and when we go to Milleridge, I always have the Yankee Pot Roast and peppermint ice cream for dessert. I guess that's it for now since I seem to be suffering from lack of inspiration! Once upon a time there was a young SPORTS PSYCHOLOGIST named HERBERT. He was SMARTLY DANCING in the SAD forest when he met JUMPY MAX, a run-away PHYSICAL THERAPIST from the POPULAR Queen ERMENGARD. HERBERT could see that JUMPY MAX was hungry so he reached into his SODA BOTTLE and give him his PICKY PIZZA. JUMPY MAX was thankful for HERBERT's PIZZA, so he told HERBERT a very BOLD story about Queen ERMENGARD's daughter PENELOPE. How her mother, the POPULAR Queen ERMENGARD, kept her locked away in an EMPIRE STATE BUILDING protected by a gigantic PANDA BEAR, because PENELOPE was so WRONG. HERBERT RAN. He vowed to JUMPY MAX the PHYSICAL THERAPIST that he would save the WRONG PENELOPE. He would SIT the PANDA BEAR, and take PENELOPE far away from her evil mother, the POPULAR Queen ERMENGARD, and STAND her. Then, all of the sudden, there was a LOVABLE TORNADO and JUMPY MAX the PHYSICAL THERAPIST began to laugh. With a puff of smoke he turned into the gigantic PANDA BEAR from his story. POPULAR Queen ERMENGARD JUMPED out from behind a PLACE MAT and struck HERBERT dead. In the far off EMPIRE STATE BUILDING you could hear a POP. It's from a site called FualiDotCom, subtitled "a complete waste of your time online". Click on Bold Words and you can write two kinds of stories. Yeah, a total waste of time but fun just the same. I got the cd from the new RENT movie today. It opens on 11/23. The best thing is that the cast consists of almost everyone from the original Broadway cast of the show. That never happens and it's usually enough to drive a theatre fan up the wall. So, I'm really looking forward to seeing the movie. I loved the show. 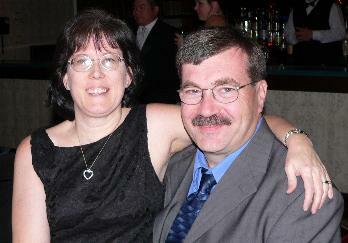 Here's a picture from the retirement party we went to recently. Take a good look. We rarely dress up like this. You might not see it for a long time! More days off this week, Tuesday for Election Day (well, the teachers have a conference day but I'm exempt - hehe) and Friday for Veteran's Day. Sounds good to me. Interpreting Urinetown on Thursday evening. I REALLY have to sit down and look at that script! We don't spend as much time on these scripts as we used to. We're better at it than we were before. Practice improves...I wouldn't say made perfect. I'll never think perfect. I always think I have something to learn. There we go. All is right with the world. Interesting, just in case I ever want to change my name. Hmm. I am 16% White Trash. I, my friend, have class. I am so not white trash. . I am more than likely Democrat, and my place is neat, and there is a good chance I may never drink wine from a box. Ever since the time change, I've been feeling sleepy. I just started to wake up a bit today. I don't know why (since we gained an hour) but whenever we have to change the clocks, my internal clock gets a little confused and it takes me awhile to get used to the change. I should go to sleep, speaking of sleepy. It's getting late. Pooh and I are going to retire to dreamland now.